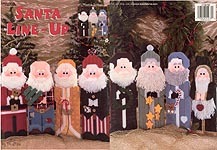 Plastic Canvas Old World Santas, designed by Sandra Miller Maxfield, The Needlecraft Shop, 1996. Beautifully detailed 3-d figures worked in 7- mesh plastic canvas, with 14 mesh for face and hands. 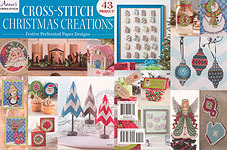 Cross- Stitch Christmas Creations: Festive Perforated Paper Designs, Annie's, 2014. 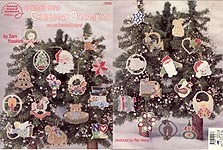 Designs to cross-stitch on 14- count perforated paper (or 14- count plastic canvas) include: 25 Advent Stockings, Festive Friends (Penguin, Reindeer, Snowman), Chevron Christmas Trees, 6 Falling Snowflakes, A Set of Santas (Holly Santa, Red Coat Santa, Star Santa, Toy Bag Santa, Jingle Bell Santa), Nativity Silhuouette Candle Wraps, Merry Christmas, Angel Tree Topper, Christmas Memories Frame, Elegant Ornament Trio, Christmas Motifs Explosion (Elf, Gift, Snowman, Candy Cane, Striped Ornament, Santa, Mitten, Gingerbread Girl, Purple Ornament), Holiday Card Duo (Poinsettia, Partridge in a Pear Tree), Peppermint Gingerbread Cottage. BRAND NEW 2014 RELEASE! 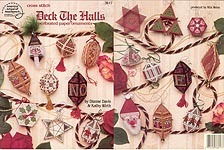 Deck the Halls Perforated Paper Ornaments, designed by Dianne Davis & Kathy Wirth, American School of Needlework, 1993. 3- D designs to work on perforated paper (may also work on 14- mesh plastic canvas) include: Elegant Noel, Berry Merry Christmas, Gingerbread People, Roses 'N' Lace, Sequins and Stripes, Royal Holiday, Golden Swirl, Santa, Starburst, Peppermint Surprise, Radiant Star, Sparkling Snowflakes, Holly Berries, Beaded Elegance, Chirstmas Tree Trio. Natty Nutcracker. Cross Stitch Ornaments!  on Perforated Plastic, designed by Dianne Davis & Kathy Wirth, American School of Needlework, 1994. Designs to work on 14- mesh plastic canvas include: Poinsettia Pillow, Beaded Pillow, Gingerbread Boy and Girl, Girl Angel, Boy Angel, Noel, Hollytime, Floral Scroll, Sequin Tapestry, The Nutcracker, Santa Claus, Snowpeople Stocking, Striped Stocking, Ruby Heart, Peace Heart. Counted Bead Christmas Ornaments on Perforated Paper, designed by Sam Hawkins, American School of Needlework, 1992. Designs to work on perforated paper (or 14- mesh plastic canvas) include: Peace Dove, The Partridge and the Pear, Joy, Holiday Rocker, Holly Berry Wreath, Polar Santa, Snowflake, Candy Cane, Christmas Chimes, Noel, Sounds of Christmas, Angel Song, Jolly Old St. Nick, Sleigh Full of Goodies, Holly Heart, An Old Favorite, Kaleidescope, Lantern Light, Hollytime Patchwork, Old- Fashioned Christmas Tree, Christmas Melody, Della Robbia, Golden Pear, Frosty Man, Poinsettia, Shimmering LIght, Teddy Christmas, Santa- 0, Angelique. Plastic Canvas Snowflake Coasters, designed by Fran Rohus, Annie's, 2016. Coaster and box worked on 7- mesh plastic canvas. BRAND NEW 2016 RELEASE! Plastic Canvas Nativity Ornaments, designed by Sandra Miller- Maxfield, Annie's, 2016. 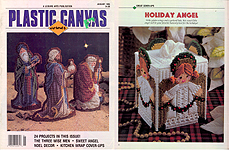 Designs worked on 7- mesh plastic canvas include: Mary & Baby, Joseph, 3 Kings, Shepherd, Lamb, Angel. BRAND NEW 2016 RELEASE! 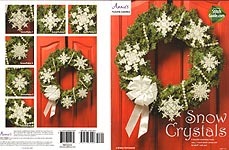 Plastic Canvas Snow Crystals, designed by Juliana Schiweck, Annie's, 2015. Six designs on 7- mesh. BRAND NEW 2015 RELEASE! Plastic Canvas Peppermint Sleigh, Celia Lange Designs, Annie's, 2015. Candy Dish stitched on 7- mesh. BRAND NEW 2015 RELEASE! Plastic Canvas Santa!, designed by Joan Green and Sandra Miller Maxfield, Annie's, 2015. Designs on 7- mesh include: We Believe in Santa, Santa Shapes (Star, Moon, Tree). BRAND NEW 2015 RELEASE! Plastic Canvas Holiday Doorknob Hangers, designed by Robin Howard Will, Annie's, 2014. Designs on 7- mesh include: Star- Christmas Candle, Indian Corn, and Spangled Uncle Sam. BRAND NEW! 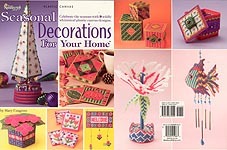 Plastic Canvas Seasonal Decorations For Your Home, designed by Mary Cosgrove, The Needlecraft Shop, 2006. Designs on 7- mesh include: Winter Treasure Box, Winter Tree Topiary, Floral Coaster Set, Pot of Petunias, Fish Wind Chime, Tropical Flower Topiary, Patchwork Welcome Sign, Autumn Coaster Set, Stacking Boxes. BRAND NEW! 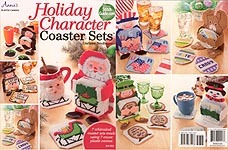 Plastic Canvas Holiday Character Coaster Sets, designed by Darlene Neubauer, Annie's, 2014. 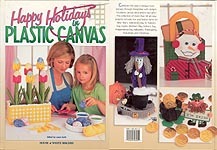 7 sets using 7- count plastic canvas: Leprechaun, Bunny & Easter Eggs, Uncle Sam, Witch, Pilgrim, Snowman, Santa. BRAND NEW 2014 Release! 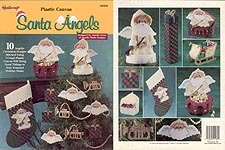 Plastic Canvas Santa Angels, designed by Janelle Giese of Janelle Marie Designs, The Needlecraft Shop, 1999. 10 designs on 7- mesh plastic canvas: Jingle Stocking, Santa Tree Topper, Sleigh Ride, Fireplace Accent, Musical Santa, Sweet Treat Santa, Card Keeper Santa, and 3 Ornaments -- Santta, gift, and trumpet. Tag residue on cover, but otherwise like new. Plastic Canvas Santa Line- Up, Leisure Arts, 2002. 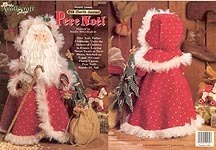 8 different 14-1/2" tall Santas (Country, Old World, Yuletide, Holly Jolly, Old St. Nick, Joyful, Starlight, and All American) plus suggestions for use as Christmas Tree Holder, Kindling Keeper, Gift Box, Doorstop, Wreath, and Centerpiece. BRAND NEW! Plastic Canvas Happy Holiday Celebrations, Annie's, 2012. 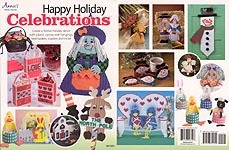 Designs in this 64- page book include: Lovebirds, Valentine Bags, Bunny Garden Basket, Peek- a- Boo Bunny, FunnyBunny Candy Holder, Springtime Treat Holders (Duck, Chicken, Lamb, Rabbit), All American Bears, Boo Witch, Halloween Wall Hanging, Treat Basket Trio (Pumpkin, Ghost, Spider), Pilgrim Children, Turkey Tales, Autumn Leaf and Corn Stalks Napkin Rings, Angel Ornament, Christmas Church holder & Stained Glass Coasters, Holiday Door Hanger Santa, Snowman Coaster Set, Reindeer Sign, Snowman Door Decor, Nativity Screen, Nativity Ornaments (Mary, Joseph, Baby, Angel, Wise Men, Donkey, Cow), Petite Treats mini- baskets. BRAND NEW! Plastic Canvas Hat & Mitten Coasters, designed by Terri Ricioli, Annie's, 2012. Worked on 7- mesh plastic canvas. BRAND NEW! Plastic Canvas Holiday Coasters, Annie's Attic, 2011. 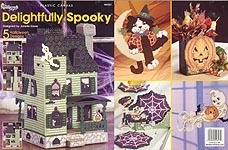 Heart set, Halloween set, and Christmas set on 7- mesh plastic canvas. BRAND NEW! Plastic Canvas Holiday Plate Mates, designed by Mary T. Cosgrove, Annie's Attic, 2011. Heads, Hands, and Feet to stitch on 7 mesh plastic canvas and attach to bamboo plate holders: Santa, Easter Bunny, and Ghost. BRAND NEW! 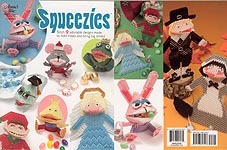 Plastic Canvas Squeezies, designed by Arlene Engeriser and Sandra Miller Maxfield, Annie's Attic, 2011. 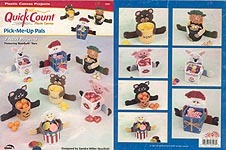 9 designs on 7- mesh plastic canvas to hold treats: Angel, Elf, Pilgrim Man & Woman, Mouse, Bunny, Frog, Duck, and Fish. Like new. Alma Lynne's Plastic Canvas Snow Folks, designed by Alma Lynne, Jeanette Crews Designs, Inc., 1998. Designs on 7- mesh include: Snow Angel, Snow Boy and Girl Shelf Sitters, Village (3 houses, trees, and Snowfolk characters), Cardholder, Wreath Sitter, and Ornaments (3 Snowfolk, Bridhouses, Snowplace like Home, Mittens, and more). BRAND NEW. 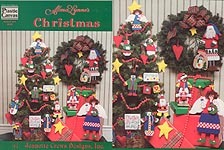 Alma Lynne's Plastic Canvas Christmas, designed by Alma Lynne, Jeanette Crews Designs, Inc., 1999. Designs on 7- mesh include: Santa and Christmas Angel Wallhangings; and Santa, Snow People, Angel, Penguin, Christmas Bear, Hearts & Stars, Christmas Joy, and Glad Tidings Ornaments. BRAND NEW. 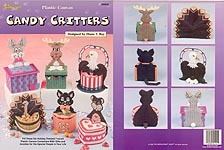 Plastic Canvas Candy Critters, designed by Diane T. Ray, The Needlecraft Shop, 1999. 6 holiday- themed containers on 7- mesh plastic canvas: Teddy Bear with Heart, Black Cat with Jack O' Lantern, Turkey, Eagle with Uncle Sam Hat, Reindeer with Gift Box, and Bunny with Egg Box. BRAND NEW. 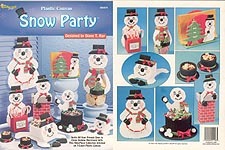 Plastic Canvas Snow Party, designed by Diane T. Ray, The Needlecraft Shop, 1999. 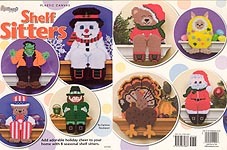 9 pieces stitched on 7- mesh plastic canvas: Chimney Doorstop, Tabletop Helpers, Sweetshop Treats, Cookie Jar Topper, Napkin Holder, Party Hat Holder, and Snow Bell Jingler wallhanging. BRAND NEW. 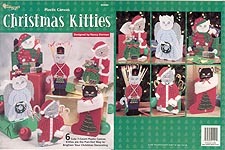 Plastic Canvas Christmas Kitties, designed by Nancy Dorman, The Needlecraft Shop, 1999. 6 pieces stitched on 7- mesh plastic canvas: Stocking Kitty, Elf card holder, Drummer Boy fireplace match holder, Santa Sweet Treats, Santa and Angel Tissue Covers. BRAND NEW. 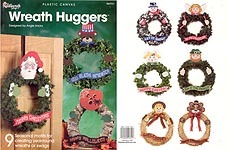 Plastic Canvas Wreath Huggers, designed by Angie Arickx, The Needlecraft Shop, 2004. 9 seasonal motifs stitched on 7- mesh plastic canvas: Santa, Uncle Sam Bear, Pumpkin, Snowman, Angel/Cupid, Bunny, Leprechaun, Scarecrow, and Turkey. BRAND NEW. 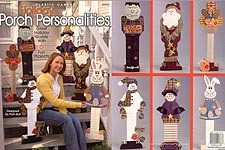 Plastic Canvas Holiday Porch Personalities, designed by Pam Bull, The Needlecraft Shop, 2003. 6 projects on 7- mesh plastic canvas include: Frankenstein, Turkey, Snowman, Santa, Easter Bunny, and Witch. BRAND NEW. 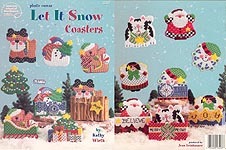 Plastic Canvas Let It Snow Coasters, designed by Kathy Wirth, American School of Needlework, 2001. 8 sets of coasters/ holders on 10- mesh plastic canvas include: Christmas Tree, Reindeer, Snowman, Bear with Candy Cane, Kitty, Angel, Snowflake, and Santa. BRAND NEW. 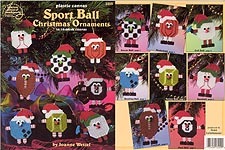 Plastic Canvas Sport Ball Christmas Ornaments, designed by Joanne Wetzel, American School of Needlework, 2001. Designs on 10- mesh plastic canvas include: Soccer Ball, Basketball, Golf Ball, Baseball, Tennis Ball, Bowling Ball, Football, Pool Ball. BRAND NEW. 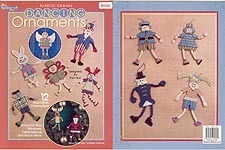 Plastic Canvas Dancing Ornaments, designed by Pam Bull, The Needlecraft Shop, 2004. 12 adorable characters include: Pilgrim Girl & Boy, Rag Doll, Uncle Sam, Easter Bunny, Little Miss Summer, Tom Turkey, Santa, Reindeer, and Toy Soldier. BRAND NEW. 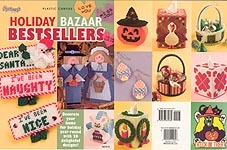 Holiday Bazaar Bestsellers, The Needlecraft Shop, 2007. 20 designs include: Easter bunny baskets & Pastel Egg Frames,, Shamrock, Leprachaun Corner Sitter, Holiday Baking Cup Baskets, Patriotic Trio, Jack- o'- Lantern Box, Trick or Treat wall hanging, Pumpkin & Easter Egg Earrings, Gobbler Tissue Cover, Turkey & Corn magnets, Pilgrim Boy and Girl wall hangings, Satin & Jewels Ornaments, Mrs. Santa Towel Topper, Christmas Candle Tissue Topper, Dear Santa magnets, Polar Pals wall hanging, hearts tissue box cover, and Love Note magnets. BRAND NEW. 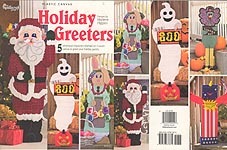 Holiday Greeters, designed by Marlene Hippen, The Needlecraft Shop, 2009. 5 designs, 31-1/2" - 43 " tall, stitched on 7-mesh PLASTIC CANVAS : Santa, Ghost, Easter Bunny, Turkey, and Firecracker.BRAND NEW. 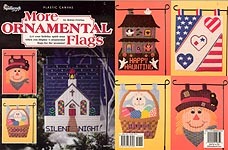 More Ornamental Flags, designed by Robin Petrina, The Needlecraft Shop, 2007. 5 designs stitched on 7-mesh PLASTIC CANVAS : Bunny in Basket, Stars & Stripes Heart, Happy Haunting, Scarecrow Falg, and Silent Night. BRAND NEW. 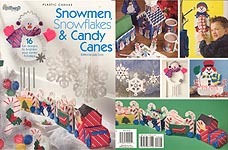 Plastic Canvas Snowmen, Snowflakes, & Candy Canes, designed by Judy Crow, The Needlecraft Shop, 2008. 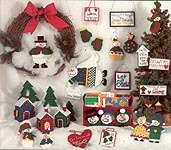 16 fun designs, including Advent Calendar, Wind Chime, 2D & 3D snowflake ornaments, Snowman Basket, Snow People (Tissue Topper, Napkin Holder, & Magnets), and Candy Cane Train & Ornaments. BRAND NEW. 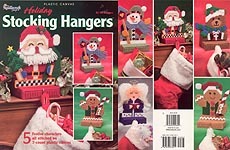 Holiday Stocking Hangers, designed by DK Designs, The Needlecraft Shop, 2008. 5 designs stitched on 7-mesh PLASTIC CANVAS : Santa, Gingerbread Man, Snowman, Bear, and Angel. BRAND NEW. 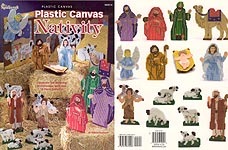 Plastic Canvas Nativity, designed by Darlene Neubaure, The Needlecraft Shop, 2005. 18 pieces to stitch, including stable backdrop, on 7-mesh plastic canvas. BRAND NEW. May have slight smell of cigarette smoke. 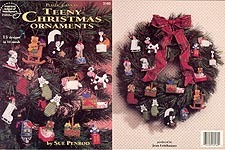 Plastic Canvas Holiday Door Toppers, designed by Terry Ricioli, The Needlecraft Shop, 2007. 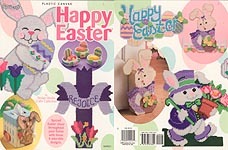 Designs stitched 7-mesh plastic canvas include: Happy Easter Bunny, Give Thanks pumpkin and fruit, Scarecrow with jack- o- lantern & black Cat, Long May It Wave flag, and Joy to the World Angel. BRAND NEW. May have slight smell of cigarette smoke. 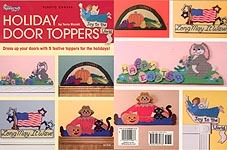 Plastic Canvas Shelf Sitters, designed by Darlene Neubauer, The Needlecraft Shop, 2007. Designs stitched 7-mesh plastic canvas include: Leprechaun, Floral Rabbit, Patriotic Bear, Frankenstein, Turkey, Snowman, Santa, and Christmas Bear. BRAND NEW. May have slight smell of cigarette smoke. 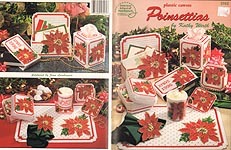 Plastic Canvas Poinsettias, designed by Kathy Wirth, American School of Needlework, 1995. Designs on 7- and 10- mesh include: Holiday Greetings Card Holder, Christmas Memories Video Cover, Coasters With Holder, Noel Mug, Box for Goodies, Tissue Box Cover, Party Placemat with Napkin Ring. Price tag on cover, store stamp on inside title page -- otherwise, like new. Happy Holidays in Plastic Canvas, edited by Laura Scott, House of White Birches, 1998. Hardcover book ; designs include: BRING IN THE NEW YEAR -- Celebration Sign, New Year's Noisemakers, Through the Seasons, New Year's Fridgies; VALENTINE'S DAY DELIGHTS -- Precious Pet Treat Baskets, Conversation Hearts Basket, Metallic Heart Wreath, Teddy Bear Cupid, Pastel Hearts, Hogs 'n' Kisses, Sweethart Frame; ST. PATRICK'S DAY FUN -- Bless Our Irish Home, Top o' the Morning' Magnet, Kiss Me Not, Bless the Irish, Irish Party Favors; HAPPY EASTER -- Tulip Time, Bunny Bookmark, Decorative Easter Egg, Easter Basket Tissue Topper, Devotional Cross, Easter Cross Ornaments, Tulip Garden, Spring Veggies; JUST FOR MOM & DAD -- Mother's Sampler, Floral Nosegay, Mom & Dad Beverage Sets, Arrowhead Desk Set, Celebration Banners; ALL- AMERICAN CELEBRATION -- Patriotic Welcome, Stars & Stripes Picnic Set, Rocket Centerpiece, Pocket Coasters, Handy Can Covers; HAPPY HALLOWEEN -- Witch's Brew Centerpiece, Pumpkin Patch, Mini Candy Bag, Halloween Graveyard, Best Witches, Trick or Treat Bag, Halloween Shelf Sitters, Sppoky Napkin Rings; A DAY OF THANKS -- Thanksgiving Angel, Autumn Florals Centerpiece, Pinecone Welcome Wreath, Thanksgiving Nut Cups, Harvesttime Bread Basket, Scarecrow Centerpiece; HAPPY HANUKKAH -- Shalom Vase, Star of David, Menorah Gift Box, Peaceful Doves Doily; MERRY CHRISTMAS -- Mr. & Mrs. Snowman, Countdown to Christmas, Gingerbread Pocket Ornaments, Christmas Candle Tissue Topper, Gingerbread Kids, Let It Snow Country Accents, Bargello Stocking, Snowman Gift Bag, Teddy Bear Christmas, Dear Santa Magnet. Like new. 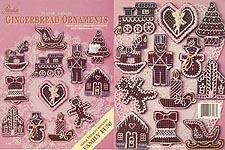 Plastic Canvas Gingerbread Ornaments, designed by Sandra Peach, Paradise Publications, 1993. 12 ornaments worked on brown 7- mesh and trimmed with dimensional fabric paint: Rocking Horse, Bell, Church, Sleigh, Engine, Toy Soldier, Tree, House, Heart, Snowman, Candle, Gingerbread Boy. Very good condition. 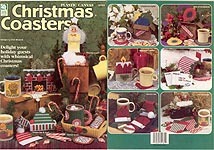 Plastic Canvas Christmas Coasters, designed by Vicki Blizzard, House of White Birches, 1997. Designs on 7- mesh include: Box of Ornaments, Christmas Lights, Letters to Santa, Christmas Candles, Praying Angel, Santa's Snack (includes Cookie Coastes, Mug, and Marshmallows), Santa's Hat, Santa's Boot & Sock, Festive Hat & Scarf, Fireplace & Yule Logs. Tag smudge on cover; otherwise, like new. May smell slightly of cigarette smoke. Quick Count Plastic Canvas Pick- Me- Up- Pals, designed by Sandra Miller Maxfield, The Needlecraft Shop, 1999. 7 seasonal mini- baskets on 7- mesh: Hogs n' Kisses, Easter Sweets, Santa Stop, Honey Bear, Midnight Kitty, Liberty Eagle, Leprechaun Luck. Some cover & spine wear, but pages are in excellent condition. 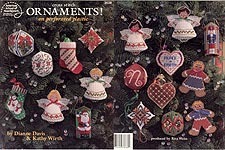 Plastic Canvas Teeny Christmas Ornaments, designed by Sue Penrod, American School of Needlework, 1995. Designs on 10- mesh include: Express Mail for Santa, Rat- A- Tat Elephant, Kittens in a Basket, celestial Cat, Presenting Teddy, Puppy- Filled Stocking, Snoozin' Mouse Slipper, Jack- In- the- Box, Ice Skating Mouse, Hop- Along Bear, Penguin on Ice, Mitten Kittens, Pig Angel, Jingle Bell Cow, and Sledding Bunny. Excellent condition. 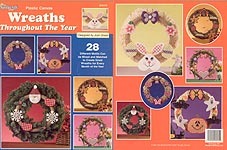 Plastic Canvas Wreaths Throughout the Year, designed by Joan Green, The Needlecraft Shop, 2002. 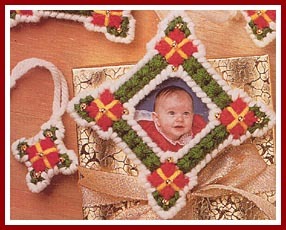 28 different motifs stitched on 7-mesh plastic canvas and plastic canvas shapes can be mixed and matched to create wreaths for every month of the year. Illustrated are: Valentine's Day (Heart, Star Flowers, Butterfly, Bow), Easter (Bunny, Egg, Flower, Bow), July Fourth (Heart, Flag Star, Eagle, Stars), Halloween (Pumpkin, Ghosts, Bats, Candy Corn,, Bow), Thanksgiving (Apple, Turkey, Pie, Leaf), and Christmas (Santa, Snowflake, Heart, & Holly). Excellent condition. May have slight smell of cigarette smoke.